Enter the imaginary world to save Ingrid in the bonus chapter! Store five types of the collectibles in the Room of Artifacts. 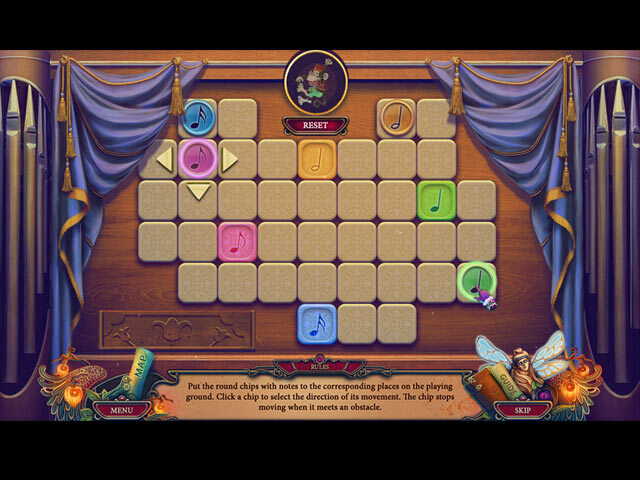 Collect puzzle pieces to reveal a character's past! Find morphing objects and earn achievements. Enjoy concept art, wallpapers, screensavers and the soundtrack. 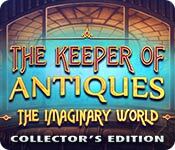 The Keeper of Antiques: The Imaginary World Collector's Edition is rated 3.4 out of 5 by 29. Rated 5 out of 5 by Majestyx12 from You have to have a Imagination to Love this game Based on the completed game and bonus material. 6 chapters + Bonus chapter. I enjoyed this game from start to finish of the bonus chapter. The game play was smooth. Was very happy with collecting three items per scene. 103 items to Collect. You collect 33 morphing objects, one per scene. You collect 36 puzzle pieces that you can put together 4 puzzles after you finish the bonus chapter. (They had a few extra in some scenes) You have 34 artifacts to collect. This has five categories. Elementals vessels, keepers' figurines, portal into the imaginary world, Bob's drawings and illusionist's tools. With these different items, it made it interesting. I don't have a problem with banners. The hops scenes are some times repeated and I don't have a problem with that. I wished the picture or items were bigger. I had to get out the magnifier. They looked small to me. I did enjoy them though. 17 hops in the main game and 8 in the bonus chapter. That makes 25 hops. I liked the music. It wasn't all the same thing. You can play and download 12 music soundtracks. I did like some puzzles. These are fun- the fish tank, shooting arrows, the vending machine and planets and asteroids in the main game. These are fun- card and sliding disc in the bonus chapter. My favorite detail was the flame robot. This game came out Jan. 2017. It's second in the series. I bought it Sept. 2017 and I just got around to playing and finishing it Jan. 2018. Rated 5 out of 5 by SparkleGlow100 from I'm putting in my 2 cents, 'cause I want this series to continue! 2017 game. I thought this game was good fun and wacky, with a great sense of imagination. In some places it was light-hearted, and only occasionally, mildly sinister. The storyline must've been good, because I played it to the end without noticing any dips in tempo! I can't speak for the bonus game, because I haven't played it. STORY - Create your imaginary world? Who wouldn't want to! However, it appears that there might have been some uncontrolled thoughts floating around, that have subsequently materialized, especially into googly-eyed monsters! (Ever watched Foster's Imaginary Friends?) GRAPHICS - Very good, with lots going on, and good structure to the scenes. HOPS - 15-18 in the main game. Bonus might have more. PUZZLES: All skippable. SOUNDS - with 4 adjustments. Pleasant, appropriate and atmospheric. Music is suitable, totally separate, and GOOD. MAP: TRAVEL JOURNAL: Contains tasks DIFFICULTY SETTINGS - 4 interchangeable HINT: Guides and leads INVENTORY - lockable CHARACTERS: Minimal interaction. The characters are interesting and display personalities you can believe and like. Good voiceovers! Rated 5 out of 5 by MsReddFox from Why So Few Stars?? I'm really enjoying this game. I bought it and I'm almost to the end. As the game progresses it gets better and better. I really like the various places you go to in the other world. I like the graphics and art work. At the beginning of the game there was an area that you had to replace a few things that looked like cardboard. Maybe that's why it got lower marks on the art. That's only one short area, and then the art work is very good from then on. Actually I enjoyed doing the cardboard items. There are many collectibles, and morphs. There's a good map and it shows a large yellow star on the areas where you found all of the morphs and collectibles. I like that feature. I found the HO's interesting and fun, and they aren't the same each time. Some of them, as well as mini games, are storybook types and I really enjoy those. The game also has several ways you can choose to play, and one is a custom. I usually do that because I like the hint and mini games to be as short a time as possible. I don't use hints on the HO's in any game because I like to get the achievement award for that. I do use hints at times to see what I'm looking for in a scene. I really don't care if I play all the mini games. If they're the usual types I skip them. This game has new ones as well as a few I've seen before. All in all I really like this game and will no doubt play it again sometime. Check it out for yourselves and you might like it as well as I do. There's a lot of fun feature in it. Rated 5 out of 5 by skullfun from ~~~Put on your Paranormal Glasses for this Superb Sequel~~~ I love this edition as much or even a bit more than The Keeper of Antiques: The Revived Book. 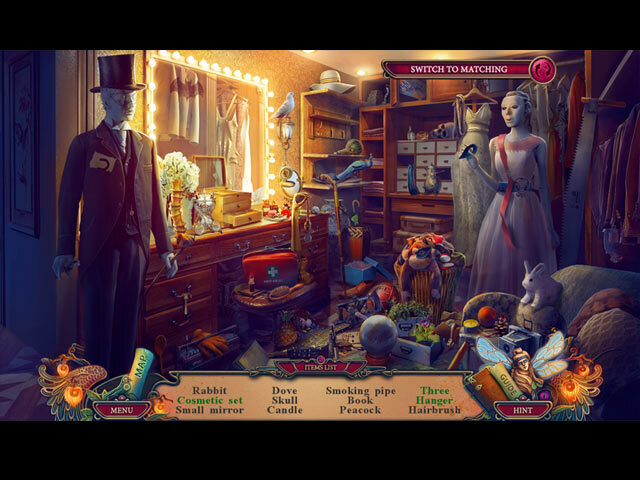 In the edition of The Keeper of Antiques: The Imaginary World is a hidden object adventure game in which you play the role of an investigator trying to save the world from a menacing threat. 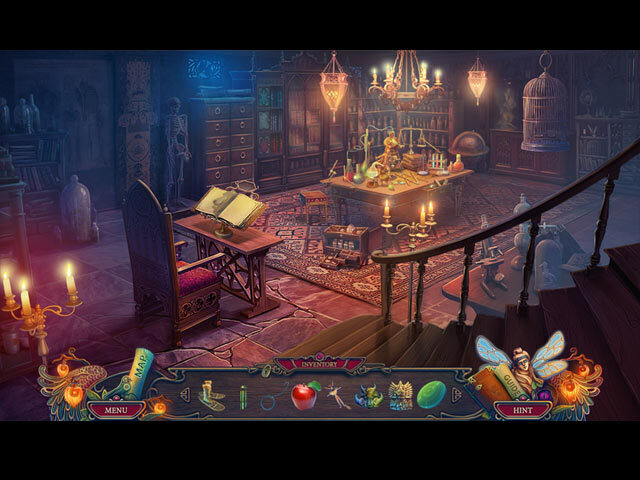 The Keeper of Antiques: The Imaginary World begins rather slowly, but picks up its pace when our character enters the portal into the fantasy world. The portal world in this game is incredibly-executed – each location is completed with fascinating animations, cool on-scene interactions and lots of eye-catching things to look at. It also helps that The Keeper of Antiques has such amazing graphics and special effects. After a few days with no contact from her uncle, Alexandra decided to pay him a visit at his Antique Shop. Not only that Uncle Paul couldn’t be found in the shop, a thief has also stolen a book from the shop. After a little snooping around, you found out that Uncle Paul went into a mysterious portal and the stolen book is your only gateway to that world. Can you retrieve back the book and save your uncle? The best selling author Morgan Atkins has written a book entitled "The Hangman Returns" which is cursed. So as a member of the order you are armed with the Keeper’s Device which will help you gain info on artifacts and other anomalies so you can progress forward through the adventure. In order to access the portal you must obtain a prism-like crystal that is the key to the Imaginary World by freeing it from Gregory Williams, a famous illusionist. Time is racing though and you must go thru the portal to "The Imaginary World" and retrieve the book before it reaches the printing press where a million copies are ready to be printed. A fate you must stop in order to save innocent lives. Along the way you meet interesting characters that are murdered in a way to make them look like suicides. There are terrific twists and turns during gameplay in order to find out why the book was cursed in the first place, then you must burn the original copy. This is where the ultimate answers lie to the back drop to this incredible story plot. I completed the main game in about 4.5 hours with another hour for the bonus game. I enjoyed this unique adventure that I will probably play it again today. Kudos to the development team for another great installment of this very engaging series. CE bling is covered fully in other reviews. I just loved every moment of game play from beginning to conclusion. Recommend for every level of player. Rated 5 out of 5 by Beadfisher from Fun and engrossing This one grabbed me from the start. Slightly cartoony graphics kept occasional grim scenes from being overwhelmingly gloomy . I liked being in the world of the game. I wanted to explore, instead of hitting the hint button to find where to go next. The pace pushed forward before I was through with the scene. You know it's a good game when you want to stick around. You know it's a good game when despite having played the Beta version, I found this new and intriguing. Okay, I admit it. I love this game. Rated 5 out of 5 by thistle809 from Neutralize those artifacts, please! I absolutely adore this game! Be prepared to let your imagination have free rein and simply immerse yourself in the story. For anyone who has enjoyed the television show, "Warehouse 13", this will be a delight! Although this is the second in the series, you will have no problem with the plot even if you have not played the first game. The story line is very good, you have a choice of four difficulty levels (including "Custom"), the dialogue is kept to a minimum (just enough to keep you abreast of what is really happening), the music is quite nice, the voice acting is wonderful, the mini-games are creative and just challenging enough, while the HOS's are varied in type and can be "skipped" by choosing to play a Match-3. The graphics are clear and crisp with an appropriate and interesting color palette. There are collectibles and the interactive map can be set to indicate when they have all been found at each location. So, if you are looking for a fun, relaxing bit of HOG play, this may just be the perfect game for you! Be careful out there; those artifacts can be sneaky! Rated 5 out of 5 by boatgirl4347 from doing my happy dance!!!! !again elefuntastic!! !awesome I love unk paul and Alexandra again 5 min into demo I knew I had to buy! !suberb start so much to see and do flawless game play great color and one of my faves the other people really answer you!!!!! alex and bob talk to each other if I want to read a bunch of lines ill get a book!!!! I loved how uniquely I had to banish the creature bravo guys I'm gonna love this game!! always get ce from elefun 4 friends domini brave giant or you will miss so much!!!!! !